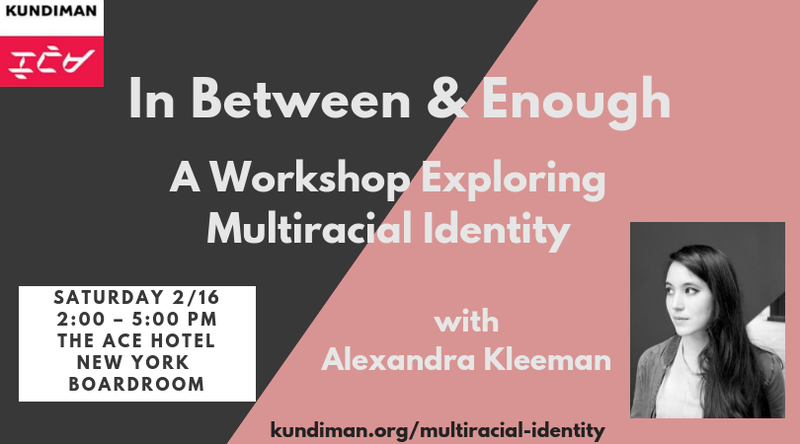 “In Between & Enough: A Workshop + Salon Exploring Multiracial Identity" is a Saturday afternoon event that will focus on exploring the multiplicity and complexity of multiracial identities, while fostering community and kinship. As those of multiracial descent are often made to feel as if they are simultaneously in between identities and not enough of either one, we will seek to create a space where they can hear each other, be heard by each other, and feel valued, valid, and enough. This workshop will be led by Alexandra Kleeman, author of You Too Can Have a Body Like Mine and Intimations. The afternoon will include generative writing, close reading exercises of published work, an intimate salon, and a space for open discussion. This class is open to all writers of color who self-identify as multiracial. Read more here!